Some of the 33 people arrested for sit-ins at College Park, Md. 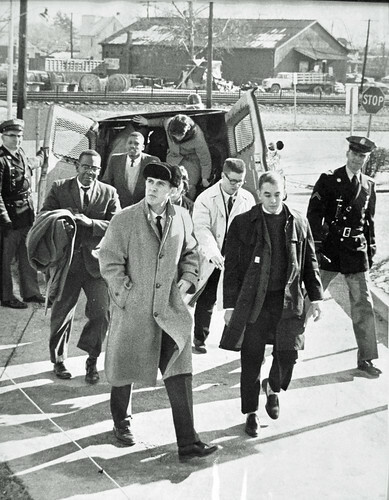 restaurants January 13, 1962 arrive at the Hyattsville police station after demanding that African Americans be permitted to dine. The protesters were arrested at the College Inn, Federal Diner and Park College Diner. No arrests were made during sit-ins at Henkel’s Steak House and at Antoinette’s Restaurant and two formerly segregated restaurants, the Little Terrapin and the Laurel Diner, served African Americans that day. A series of sit-ins led by the local chapter of the Congress of Racial Equality (CORE) and the Baltimore-based Civic Interest Group were conducted across the state, including a number at cities and towns on Maryland’s Eastern Shore. The sit-ins continued throughout the half of the year, resulting in clashes with local segregationists and several hundred arrests. Charges were ultimately dropped against the 33 arrested at the three Prince George’s County restaurants. The campaign, along with the overall U.S. civil rights movement, resulted in a 1963 Maryland law that partially prohibited discrimination in public accommodations. The law was broadened in 1964 and upheld in a state referendum by a 54-46 percentage. Congress also passed its version of a ban on discrimination at public accommodations in 1964. College Inn, College Park, Md. – Trespassing - Pamela O Long, Alma H. Heller, Lewis Raskoff, Leroy M. Boardly, Ronald A Dixon. Federal Diner, Beltsville, Md. – Disorderly Conduct - Samuel A Aervitz, Phyllis Kaufman, Star P. Carroll, Gina M. Kobren, Richard J. Ochs, Harry Whitten, Gloria C. Gail, Jerome R. Kirk, Barbara Jacobs, Rosemary W. Hawkes. Park College Diner, College Park, Md. – Disorderly Conduct - Clarice A. Henry, Thomas R. Schaeffer, Wardell J. Lindsey, Charis Crosse, Leroy Coniglane, Katherine C. Moore, Felix M. Rice, Cephas D. Hughes, Susan C. Wise, George C. Burgan, Judith Sherman, Jacqueline Seif, Marvin A Raps, Gifford Pinchot III, Phyllis B. Hammond, Andrew D. Miller, Daniel J. Barker, Peter T. Dawidowicz. Photographer is unknown. Courtesy of the D.C. Public Library Washington Star Collection © Washington Post.